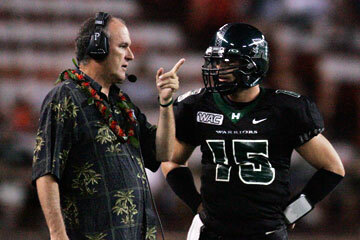 UH coach June Jones talked with quarterback Colt Brennan during the second quarter of Saturday's game. Sometimes it's hard to believe, but, yes, it really did happen. In 2001, Hawaii's Nick Rolovich passed for 20 touchdowns and 1,548 yards in the last three games of the season. But after Saturday's 44-9 victory over Eastern Illinois, UH coach June Jones implied that something even more incredible is going on right now. "This is the most productive the offense has been since I've been here," said Jones, who has been the Hawaii coach since 1999. Colt Brennan threw for "only" five touchdowns and 409 yards Saturday, but he did it in less than three quarters. He is also more accurate than Rolovich (or anyone else in school history), with a completion rate close to 70 percent in the first 17 games of his college career. Rolovich had Ashley Lelie as a big-time target, and though they are different kinds of receivers, Brennan has one in Davone Bess. Brennan also has at least five other pass-catchers capable of a spectacular showing on any given night. Saturday it was Ian Sample, who broke out with six receptions for 122 yards and two touchdowns and was starting because Ryan Grice-Mullins, a 1,000-yard receiver last year, was out with an ankle sprain. The way the Warriors were getting open, it didn't seem to matter who was running the routes. Some of the plays were run arounds, some were just reading the coverage." Brennan said. "It feels easy. But I don't like saying it is easy, because it's not." It wasn't simple by any means for a series in the second quarter, when Brennan had two passes batted down by Eastern Illinois defensive linemen. The Warriors' drive died on the Panthers' 43. It was the first of just three possessions with Brennan at the controls that didn't end beyond the EIU goal line. He was also intercepted late in the first half, and Nate Ilaoa lost a fumble. "There was a couple of times in the first half I was frustrated with (Brennan)," Jones said. But for the most part, Brennan did it right, picking apart the Panthers' zone defense. "It's something you may never see again," Jones said. "There are a lot of seniors, the offensive line." Brennan is a junior, but if he keeps completing passes at a 70 percent rate with a 5-to-1 touchdown to interception rate, he could be gone, too. Some NFL scouts may see him as a bit frail at 6-foot-3 and 200 pounds, but many smaller quarterbacks have succeeded in the pros. For now, Jones and the 2-2 Warriors hope Brennan can continue to roll like Rolovich did at the end of 2001 -- starting with Saturday's WAC game against Nevada. Brennan knows every game from here on in is big. "If we dropped this game it would've shattered our whole season," he said. "We gotta give every team that steps in our way hell." The other side of the ball: The Warriors made a statement on defense by stopping the Panthers' first possession without a first down. "That's what we wanted to do. Come out there and not let them have any hope," defensive end Ikaika Alama-Francis said. "We made a few mistakes early on defense but we got them straightened out." The biggest was letting Vincent Webb go 69 yards in a short-yardage situation before Kenny Patton caught him from behind at the Hawaii 9. Norris Smith ran in EIU's only touchdown on the next play. "We're going to have to play better (defense) in the next two weeks," Jones said. Stat chat: For various reasons, the big names aren't always at the very top of the national numbers lists. For example, Brennan is only 10th in quarterback efficiency. But he's one slot ahead of Ohio State's Troy Smith and one behind Florida's Chris Leak. » Brennan leads the nation in points per game responsible for, at 23.0. He is second in total offense with 372.3 and second in passing yards with 360.75. » Bess also leads the nation, in receptions per game with 7.75. He is tied for 13th with 90.0 yards per game. » As a team, UH is third in total offense at 500.5 yards per game and second in passing yards with 409.0. » The total defense is now 88th at 363.75 yards per game. Injury report: Two Warriors backups were hurt in the win over Eastern Illinois. Linebacker Blaze Soares, who made a tackle on a kickoff return, may not be able to play Saturday against Nevada because of a pulled hamstring. Guard Laupepa Letuli is believed to have suffered a leg injury, but Jones did not know his status for the Nevada game. Second-string running back Reagan Mauia didn't see action against the Panthers because of a tender shoulder, but could have played if necessary. Backup QB Tyler Graunke is expected to be available against the Wolf Pack, Jones said. He was held out of the EIU game because of academic issues. The Setup: Hawaii 0, Eastern Illinois 0; less than 13:00 remaining, first quarter; Hawaii ball, third and 10 at Eastern Illinois 29. The Play: After eight straight passes to start the game -- but the last two incomplete -- right slot Ross Dickerson goes in motion to the left, leaving Ian Sample the lone receiver on the right. Sample angles to the center of the field, a step ahead of cornerback Terrance Sanders. Colt Brennan's throw is on the money. The Impact: The Warriors set the tone to start the game and don't have to settle for a field goal on the first drive. It is the first of five touchdown passes for Brennan and two TDs for Sample. Brennan: "It's a choice play where we read the safety. The read was good and Ian ran the skinny post." The Setup: Hawaii 7, Eastern Illinois 0; 12:48 remaining, first quarter; Hawaii ball, kicking off from Hawaii 35. The Play: Mike Malala leads the coverage charge downfield. He leaps over wedge blocker Dave Campione, somersaults, and gets credited for a tackle when, with help from Leonard Peters, he kicks returner Adam Kesler down at the Eastern Illinois 19. The Impact: Eastern Illinois' kickoff return never recovers. Its best field position on eight Hawaii kickoffs is the Eastern Illinois 26. Five drives start behind the 20 as Hawaii's Blaze Soares, Ryan Keomaka and others join Malala in going around, through and over the blockers. Malala: "We'd been talking about it all week. ... Coach (George) Lumpkin, he has a bunch of pictures in his office of guys doing that same thing." The Setup: Hawaii 7, Eastern Illinois 0; less than 12:00 remaining, first quarter; Eastern Illinois ball, third and 8 at Eastern Illinois 21. The Play: Flanker Kesler takes a handoff on a reverse and cuts up around right tackle. Unblocked linebacker Adam Leonard remains in perfect position to make the play, and he sticks Kesler after a 3-yard gain. The Impact: Eastern Illinois must punt from its own 24 after failing to make a first down. In little more than 3 minutes of game-clock time, Hawaii shows signs it is prepared to dominate all three phases of the game. Leonard finishes with a game-high 10 tackles and Hawaii allows 291 yards (69 on one run by Vincent Webb). Leonard: "We always have effort. We just have to be efficient and cut down on mental mistakes and we'll be great." The Setup: Hawaii 21, Eastern Illinois 9; less than 7:00 remaining, second quarter; Hawaii ball, second and 15 at Eastern Illinois 43. The Play: On another choice route, Sample reads post and slips behind the linebackers and in front of the safeties, who are split in deep zone coverage. Brennan hits Sample in stride, allowing him to easily cover the final 15 yards for the touchdown before the safeties can converge. The Impact: After yet another botched PAT, Hawaii leads 27-9. Sample finishes the night early, with career highs of six receptions, 122 yards and two touchdowns. It is evident at this point that Hawaii can name the final score against its Division I-AA guests. Sample: "They were playing cover-two (zone defense) a lot and that opened a lot of holes for the outside guys." The Setup: Hawaii 44, Eastern Illinois 9; 9:05 remaining, fourth quarter; Hawaii ball, fourth and 1 at Hawaii 20. The Play: Inoke Funaki rolls right and spots Malcolm Lane open downfield on the right sideline, behind the defense and more than 40 yards beyond the line of scrimmage. Lane makes his first college catch and goes for a 58-yard gain before he is brought down by Irvin Jean-Charles. The Impact: None on this game; the Warriors don't even score after it. But this freshman-to-freshman combo gives a tantalizing look at potential (granted, against Division I-AA backups). Games like this are valuable, since banged up starters can rest and talented young players can get experience. Funaki: "A lot of good stuff happened here and there, but there's still a lot of stuff I have to work on. Sacks (No.-Yds. ): A. Purcell 1-12, Lafaele 1-9, M. Purcell 1-9, Veikune 1-8, Kalilimoku 1-5, Leonard 1-2. Total: 6-45. Interceptions (No.-Yds. ): Peters 2-47, Patton 1-19, Hawthorne 1-0, Newberry 1-0. Total: 5-66. Fumbles (Total-Forced-Recovered): Peters 1-1-0, Hawthorne 1-1-0. Total: 2-2-0.